WHAT IS ASIAN AMERICAN MUSIC? What is “Asian American music”? Some argue that it is not only a useful political and heuristic device, but also a beneficial term for building a community of artists. Others, however, have posited that we should not use this term because there is no distinctive musical style in music made by Asian Americans. 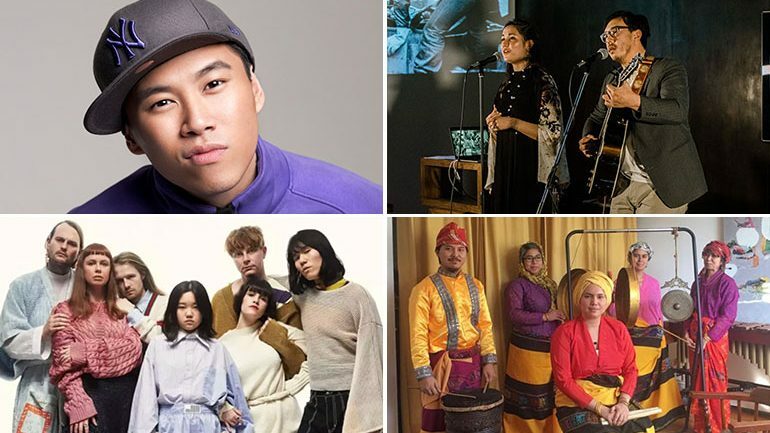 This panel explores how Asian American musicians participating in different genres use style to contend with stereotypes and the North American racial landscape. What do we desire when we desire the existence of an Asian American music? What would be achieved by identifying a musical style as Asian American? Style, I argue, can allow members of a minority to recognize one another and thereby form communities (i.e. punk style, queer style), but at the cost of a public language that can be commodified, appropriated, and used to limit that very group’s expressive options. This paper engages with the indie band Superorganism, and in particular its lead singer Orono Noguchi. The obstacles that Asian Americans’ racial identity incurs become ever manifest when they aim to survive in rap music, a genre that has dominantly been perceived as a cultural signifier of blackness. The first Asian American rapper with a legitimate chance to find mainstream success did not appear until the early 2000s when Chinese American MC Jin gained his fame out of BET’s 106 and Park freestyle battle competition. Jin’s increasing popularity makes his “inauthentic” race ever apparent. Drawing on scholarships in Asian American studies (Ancheta 2006; Fong 2008) and rap music studies (Wang 2007), this paper aims to discuss the issue by offering a close reading of two rap tracks by Jin—“Learn Chinese” (2004) and “Chinese New Year” (2014). My paper considers how performance analysis can illuminate the ways in which Asian and Asian American performers of Western art music have operated within and responded to racialized narratives of difference. I first explore how Asian and Asian American performers are faced with a conflicting narrative of inclusion and exclusion in American society. I then argue that these narratives have challenged Asian and Asian American performers to renegotiate their identities vis-à-vis the hegemony of whiteness in Western art music. Looking Back: Spall Fragments: Taiko Drumming-Dance Action-Adventure for the 21st Century! For the past fifty years, taiko drumming has served as a popular vehicle for Asian Americans to express self-identity and empowerment, embody ancestral memory, and combat stereotyping. Spall Fragments, my original, evening-length stage production, mixes taiko, dance, and serio-comic theatre, as a critical response to the explosion of problematic issues surrounding Asian American taiko practice. Supported by media samples of the performances, through critical discussion of Spall Fragments’ creative processes, I will outline the intricate landscape of contemporary Asian American taiko before concluding on how a new wave of taiko practitioners navigate these persistent issues. No-No Boy is a multimedia concert performed by Julian Saporiti and Erin Aoyama, doctoral students at Brown University. The No-No Boy workshop will focus on a close examination of the power of storytelling through recovery and curation of archival imagery, specifically about questions of immigration, identity, incarceration, migration, and refugees across Asian America. Saporiti and Aoyama, as researchers and artists, will discuss with participants the ways in which they utilize archival visuals to create an added visual dimension to their storytelling and music. The duo will break down their process of combining songwriting, scholarship, and film editing to create their work, inviting participants to think about how the intersection of historical research and personal identity exploration might serve their own art making processes.